by the Royal Commission on Historical Manuscripts; Macray, William Dunn, 1901 contains this fasinating document (click for large version; transcription and translation below). The original was in the archives of St George’s Chapel at Windsor Castle, and may still be there. 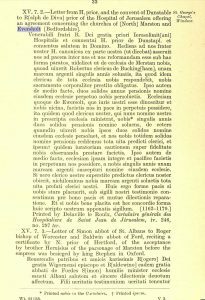 It was also printed, or perhaps misprinted, in Cartulaire générale des Hospitallers de Saint Jean de Jerusalem, by Delaville le Roulx; Paris, 1894, which the notes and footnotes in the report above acknowledge, but the Cartulaire version seems to be wrong, since its changes to the text make a nonsense of the business deal and make the priest feminine. I [EJW] am going to ignore the Cartulaire version. marcam argenti suscepturi nomine eiusdem ecclesie. pro bono pacis et mutue dilectionis reparatione. To venerable brother Ralph, by the grace of god prior of the Hospitallers of Jerusalem, and to the community, H prior of Dunstable, and the congregation, I would greet you in the lord. Returning to us, our brother canon H., on your behalf (so he says), has declared that you, for renewed peace between us and you, be prepared under this form, namely that our church of Marston, as long as the priest Robert of Buckingham will have lived, you would pay one mark of silver for every year, so that the same cleric will answer to you for the whole church, to stand before you bound bodily and by sacrament. He having been taken from amongst us [ie after the priest has died], you will pay in perpetuity two shillings per year of rent in the name of the same church. Also the church of Eversholt, which is recognised to be yours of right and neighbour to us, you will appoint us to possess in peace in perpetuity, so in fact that your priest, who now ministers in your name in the above-mentioned church, paying to you every year two shillings in the name of rent, henceforth, as long as he will have lived, to us, himself, he will pay two shillings in the name of the same church, and we just as many shillings in the name of rent I will hand over to you the whole life of the aforesaid priest, and indeed you will make him himself provide a sworn oath, to be observed, in addition to by faithfulness to us. He having been taken from amongst us, you will cause us to possess wholly and peaceably the church itself in perpetuity, to receive from us every year one mark of silver in the name of the same church. If, however, by your priest survivor, our aforesaid priest should have died, nevertheless to us one mark of silver you will pay for the whole life of your aforesaid priest. Therefore, if to this form of peace would have been agreeable to you, under our seal for proof, we agree for the good of peace and of mutual love by restoration. And if you be well pleased with the form of this agreement put your seal to this document. 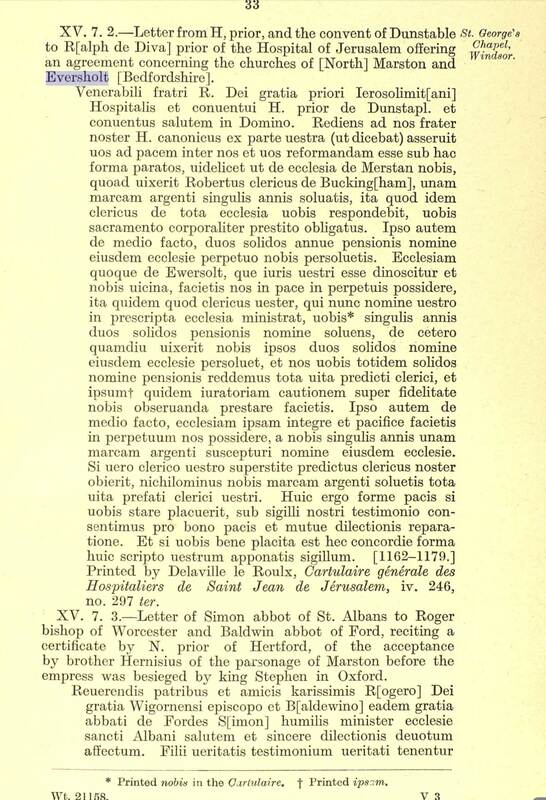 This is a proposed contract between Dunstable Priory, founded by Henry I for Augustinian canons in 1132, and the Order of Knights of the Hospital of Saint John of Jerusalem, or Knights Hospitaller, founded by 1113, after the first crusade. The Knights Hospitaller were associated with a hospital and hospice in Jerusalem, providing medical care for pilgrims, and soon became an armed force, providing security services for pilgrims too. The document is not dated but is estimated to have been written some time between 1162 and 1179. Henry II is on the throne, and Becket was murdered in Canterbury Cathedral in 1170. It’s not clear whether the contract actually was eventually agreed. The original document was, and maybe is, in the archives of St George’s Chapel at Windsor Castle. Since it is preserved in an archive, it seems likely that the contract was sealed and did come into effect. It’s clear there has been some substantial dispute between the priory and the Hospitallers over the running of two churches. H, prior of Dunstable (we don’t know his full name), sent a canon of Dunstable, again confusingly known only as H, to R, Ralph de Diva, prior of the Hospitallers. Canon H returned with the outline of a deal. Prior H drew up and sealed a contract and sent it back to prior R for his seal. It seems that Marston church (North Marston in Buckinghamshire, north of Aylesbury) belonged to Dunstable Priory. Quite what “belonged to” meant at this time is not clear. The system of advowson for appointing priests doesn’t seem to have been established then. Anyway, Robert of Buckingham is the priest at North Marston church, and the priory is offering to rent the church to the Hospitallers in perpetuity, complete with its incumbent priest. While Robert lives, he will report to the Hospitallers, and the Hospitallers will pay rent of one silver mark per year to the priory. After Robert dies, the Hospitallers will pay two shillings per year rent to the priory. It’s not clear quite how much money this is. Eversholt Church belonged to the Hospitallers. That would be why it’s dedicated to John the Baptist, patron saint of the Hospitallers. The priory proposes that the Hospitallers rent Eversholt Church to the priory in perpetuity, complete with the incumbent priest, unfortunately unnamed. The Eversholt priest is currently paying 2 shillings per year rent to the Hospitallers. If the deal goes through, he’ll pay that to the priory, and the priory will pay two shillings to the Hospitallers. After the priest dies, the rent goes up (I think) to 1 silver mark per year paid by the priory to the Hospitallers. The Hospitallers have to get the current Eversholt priest to swear an oath of loyalty to the priory. They have to keep paying one mark to the Priory while Robert of Buckingham lives, even if the Eversholt priest dies. The earliest parts of North Marston Church date from 1150. Eversholt Church was built about the same time. Footnote 88 [!] of the section on Dunstable Priory in A History of the County of Bedford tells that the priory transferred Marston Church to the canons of Windsor in 1450, so that may be how the contract ended up in the archives there. All this machination was happening within living memory of the foundation of both churches. A mark of silver is two thirds of a pound (weight of silver metal?). A solidus, which I have translated as shilling, may have been worth one twentieth of a pound. So the two shilling rent was much lower than the one mark rent. Much thanks to Pacifica for putting me right on an impenetrable bit of Latin.